The Ebac Kompact Dehumidifier is a useful addition to the range of Ebac dehumidifiers designed for the restoration specialist. Ebac have built in to this dehumidifier all the power of their other restoration units but have made the overall package more compact, more manageable and more convenient. This has all been achieved while keeping the cost of this unit on a par with other comparable dehumidifiers in the restoration range. The Ebac Kompact Dehumidifier is a medium capacity unit with a water extraction rate of 56 pints per day at 80°F and 60% relative humidity. These conditions are those applied by the Association of Home Appliance Manufacturers (AHAM) for comparative testing of dehumidifiers designed for the domestic market. In the more severe conditions frequently found in industrial and commercial applications, and particularly in restoration projects, this rate can rise to a maximum of 120 pints per day. 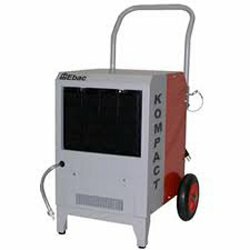 This power enables the Kompact to dehumidify an area of up to 1000 sq ft (manufacturer's recommendation) which makes the unit suitable for smaller to medium sized projects. Given its power the Ebac Kompact dehumidifier is, as its name suggests, a relatively compact unit. The overall dimensions of the Kompact are only 20 x 19.2 x 24.2 inches. This modest overall size makes it more manageable in areas where space is restricted. The Kompact is portable. For movement on site it has a pair of rugged wheels with semi-pneumatic shock absorbing tyres and an integral handle, which folds away conveniently when not in use. Weighing just under 78lb and, with its small size, it is easily transferable from site to site as needed in even the lightest vehicle. It is easily operated by a single person giving flexibility and saving money. The Ebac Kompact can deal with all the tough conditions it may be faced with and is capable of low temperature operation. Ice formation on the coils is dealt with by Ebac's hot gas defrost system which actively melts the ice as it forms. This feature enables the Ebac Kompact to operate at temperatures down to an impressive 33°F, an essential feature for restoration work in cooler areas and many industrial and commercial applications. The Kompact is ruggedly constructed and durable enough to withstand the shocks and vibration to which it may be exposed. The unit is mounted on a sturdy chassis and surrounded by a strong casing, both made from heavy gauge steel. The casing is further protected from damage by a tough epoxy powder coating. The working components are robust and include a high efficiency rotary compressor which also makes the dehumidifier energy efficient. An essential feature of the Ebac Kompact is its capability of continuous drainage. A dehumidifier used for restoration work needs to work 24/7, to meet customer expectations and to release the unit as soon as possible for the next job. Most dehumidifiers have a discharge port to which a hose may be attached to drain the condensate to a nearby drain but this unit goes one better with an integral condensate pump which will force the water to a less convenient drain, up to 100 feet horizontally or 20 feet vertically, distant from the dehumidifier. A final feature thoughtfully provided by Ebac is an hour meter providing accurate run-time measurements, invaluable for costing/pricing work etc.